Woo, it's (almost) Friday!! I am ready for the weekend. I was working 7-1 this week, so I'd be good with not getting up at 5AM for a while! Here's this week's sketch. I designed it a few days ago. Thursday came around and I hadn't made my sample yet. I actually haven't done much of anything in the creative department this week. I made it my goal to get it done. I have to say, I ended up being so inspired, I made two! I used circles, feel free to use flowers, butterflies, hearts, stars, or anything else! 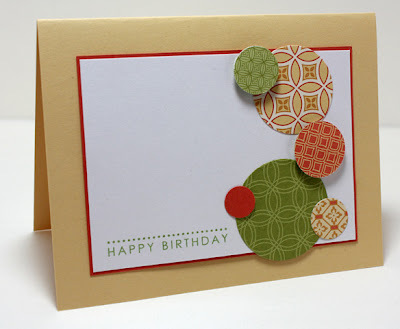 For my circles, I used the 4 smallest circle nestabilities, as well as a 1/2'' circle punch and a 3/4'' circle punch. My circle placement deviated a bit from the sketch. 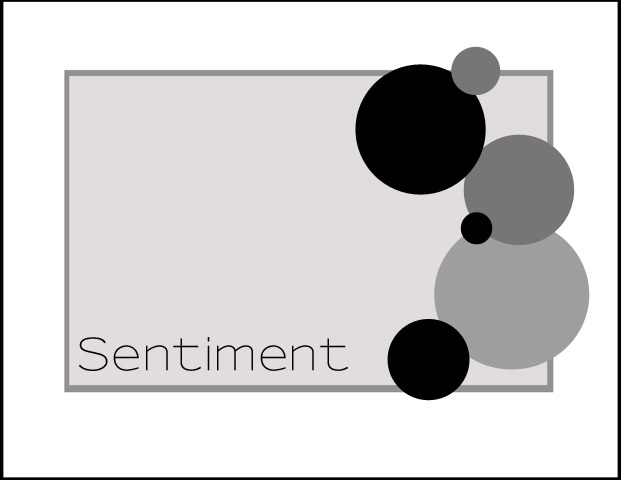 The idea is to have around six elements that overlap in a vertical line. Here's my first card, why yes, I am still on a Haiku kick. (I wish I could've made that into a Haiku, ha!) I just love the So Saffron, Tango Tangerine, More Mustard, and Old Olive colour combination! This paper may have retired a year ago, but I think it's still pretty fresh! Since I had all sorts of patterned paper out and about, I put together another card. This time I used Urban Oasis. It was nice to bring out the Baja Breeze again! I quite like this paper's colour combination too! As always, feel free to provide a link to your project here! This is a great layout for scraps! I'm going to work on this tonight!! Love your blog!!!!! OMGosh this is EXACTLY what I needed. Thanks ever so much...it's wonderful, and so are your cards. Nice! The Haiku paper is available on the clearance rack at SU!--I just got a set. Love it!! You'll be happy to know that Tangerine Tango and Baja Breeze will be back for good this summer as part of SU! 's color renovation. So exciting!! Oh my gosh, this sketch is fabulous! 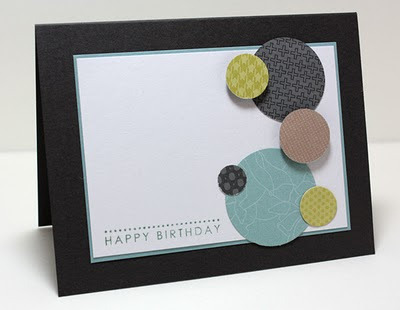 Paper Scraps, round stamp images, lots can be done with it. These cards are wonderful ~ they bring a smile as I look at them!! I just love these cards & layout!! How simply stunning! Woohoo! FUN layout! I am gonna play tomorrow. LOVE this one! love this sketch :) great idea for a card I need to make tonite! Love your cards! Sun a fun and easy sketch to work with! Thanks!! This looks fabulous in both variations. And I happen to have both these patterned paper packs myself. I'll definitely be giving this sketch a try over the weekend. This sketch is so FUN. I can't wait to see what everyone else has done. You're sketches are always fabulous. Thanks a million Natasha. I had fun playing with this sketch and plan in using it as a favourite! I just couldn't resist this sketch and I suspect I'll make more than one card with it as inpsiration. The possibilities are endless. Thanks! This is a great go-to sketch! I was able to use a bunch of scraps for mine :) Thank you! Thanks. Another great CAS layout. A wonderful way to use all those DP and stamped scraps. This was a great sketch! I used it with another challenge and I love the results. Love the sketch - Clean and Simple is still difficult for me. Thanks. Here is my card!! Great sketch! I just love this layout! Thanks so much for the inspiration. This is my first ever challenge. I can`t wait to join in some more. Fab sketch, love it. great challenge and great cards! what an awesome way to use scraps. I loved this sketch and just had to make more pinwheels for the circles. Thanks for keeping my mojo flowing! Just posted mine! You girls make this look so easy! But clean and simple is hard for me. I resisted more dp and inking the edges and I think it will do. Have a wonderful week and thanks for inspiring me to try Clean and Simple! Oh my goodness the sketch is freakin' awesome!! And your cards are just absolutely GORGEOUS!!! What a great sketch! I had so much fun working with it! Love it, love it...and love Haiku, too! I need to do more with circles, too, so this is great. Thanks a bunch. Great sketch, and it was just what I needed for a Mother's Day card! Thanks! Fantastic sketch this week...enjoyed playing with it...great DT samples too...thanks for sharing. LOL oopps ... just left a link & comment on FTL83 for my card for sketch FTL86! Can you tell I have lots on my mind. Thanks for a fab, fun card. I really did have lots of fun with this one! What a GREAT idea for using up scraps AND making a card suitable for a man at the same time! Just TERRIFIC! I love this sketch--it is so versatile! This is a fabulous sketch. Great for so many occasions. Thanks! thank you for this awesome sketch!!! love your sketches! Hope you don't mind! Thnaks for the inspiration.